Queen have made UK chart history by becoming the first act to sell six million copies of an individual album. Their first Greatest Hits collection, which includes the hits We Will Rock You and Bohemian Rhapsody, has extended its lead after being Britain's highest-selling album for several years. The Official Charts Company said one in three British families now owned a copy of the 1981 compilation. Queen guitarist Brian May said the feat was "incredible". "Great news, amazing news from the Official Charts Company," he said. "I just want to say thanks to everyone who has supported us through the years, we hope to continue to serve you." Band mate Roger Taylor added: "Wonderful. Who would have thought it? And all due to the great British public. Thank you. A great honour!" They never appear in pundits' polls but many bands' best records are their Greatest Hits: from Abba Gold to Divine Madness. So it's no surprise that one in three households owns a copy of Queen's Greatest Hits. Individually, Queen's albums have plenty of filler (the embarrassing Don't Try Suicide) but the hits album is practically faultless. They're muscular on We Will Rock You and majestic on Bohemian Rhapsody. But the compilation also shows how weird Queen could be for a mainstream chart act – witness the "we do like to be beside the seaside" coda on Seven Seas of Rhye. For casual fans, it's the only Queen album they'll need… although getting the second volume wouldn't hurt. Queen's Greatest Hits leads the all-time album chart by some 900,000 copies, ahead of Abba's 1992 greatest hits collection Gold. However, Adele's 21 is catching up on the top spot quickly. It has sold an impressive 4.7m copies in just three years. 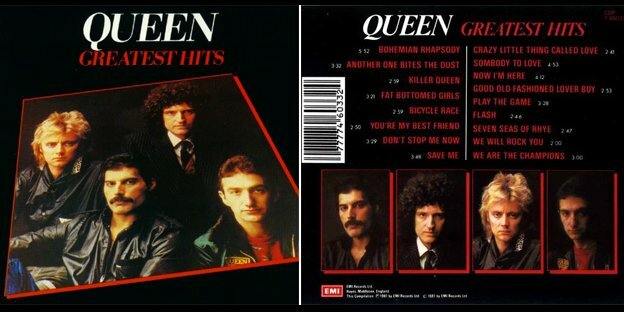 The Official Charts Company said Queen's album – which also features Another One Bites The Dust, Bicycle Race and Fat Bottomed Girls – regularly sells several thousand copies per week, particularly around Christmas.